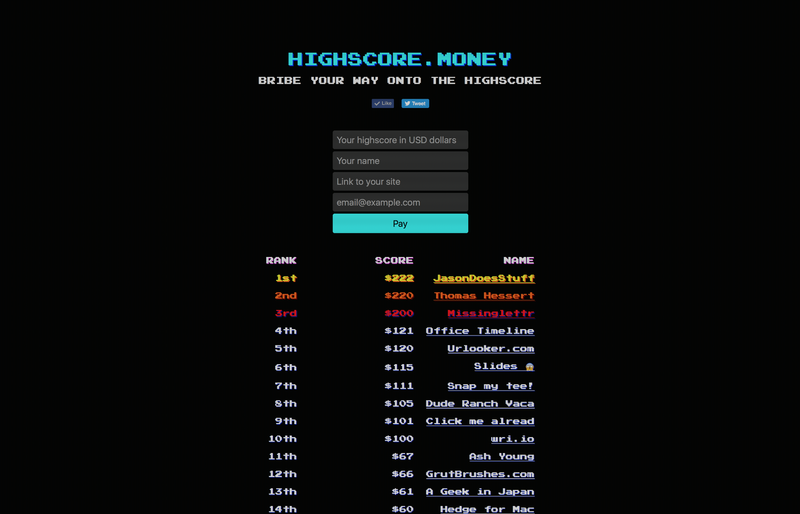 Yesterday I launched highscore.money, a public leaderboard you enter by paying. Whichever amount you decide to pay, that’s your score. The more you pay, the higher your ranking. So far people have paid me $2,251 to be included. Back in December I was chatting with levels.io about monetising our websites and how money doesn’t necessarily make you happy. In fact, research shows that $75,000 per year is about the threshhold. Anything you make after that doesn’t make you happier. That said, for us entrepreneurs, revenue is still a nice way to “keep score” and see how well our businesses are doing. It’s like playing tetris, you don’t do it for the score, but it makes the whole game more meaningful. This initially lead me to the idea of having a public leaderboard of how much money everyone is making, but it seemed difficult to get people onboard. I still liked the idea of combining a highscore with money so I thought: why not have people pay to be in the highscore list instead? It’s the ultimate pay-to-play game and a nice status symbol. What you pay, is your score. The more you pay, the higher your score. It’s a ridiculous idea, but it might just work. Worth a shot so I quickly built it that day. It’s May 29th, 5 months later, and I completely forgot about highscore.money — I made it, but never showed it to anyone. During another chat I remembered that I still needed to launch it and levels.io pushed me to launch it the very next day. Thanks for the motivation Pieter! I also made sure there was at least one entry by paying $10 myself, so the site didn’t look like a total ghost town. I proceeded to submit it to some community news sites like Product Hunt and Hacker News where it did really well, until it got kicked off the frontpages since the moderators didn’t feel it was good fit. I disagree, but it’s their site so they are free to whatever they want. No hard feelings. I also put it on my own BetaList, obviously. I knew getting the first entries would be the hardest. People don’t want to be the first and like to see someone do something first. In psychology this is known as social proof and it’s why many marketing sites have testimonials of previous customers. Eventually though, someone did chip in $5. It was an iPhone app to simultaneously play music with your friends. Pretty cool idea actually. Boris (CEO of The Next Web) wrote a quick story about it which was shared with The Next Web’s 1.66 million(!) Twitter followers which drove even more traffic to the site. At some point I even got a message from someone offering to invest $1,500 for a 10% equity stake. Although the $15,000 valuation wasn’t bad, it just felt like it would complicate things too much so I ended up not taking him up on the deal. Right now the high-score is $222 (🙌 Jason Zook! ), 51 payments have been made averaging $44 each for a total of $2,251. Not bad for one day’s work and a project I almost forgot about. It will be interesting to see where it will go from here! 💚’s below are appreciated! Thank you.